Once upon a time I loved to paint my nails – back when I was in school and had hours to spend on creating fiddly nail art, waiting for fancy top coats to dry and doing it all over again a few days later. Then adult life happened and I stopped bothering, mainly out of the frustration of seeing my lovingly painted nails chipping and peeling off within a day. In between work, fitness and social life, there just wasn’t enough time for constant nail maintenance. I’ve never seen the point in spending time and money on getting my nails done, and as someone who types a lot at work and plays the piano, I have to keep them fairly short anyway. Sure, it bothered me a bit, always having short, plain, boring nails – but there just wasn’t a convenient enough alternative. Then, just before Christmas last year, my colleague told me about her do-at-home gel nail kit from SensatioNail, which – so she said – let her create perfect manicures that last, all within a few minutes. This sounded a bit too good to be true, but I was sufficiently intrigued to grab a starter kit. And it actually works. With the SensatioNail system it takes me about twenty minutes to paint my nails, with no drying time, and each manicure I’ve had over the past half year lasted for two weeks or more. No chipping, no peeling – just perfect, glossy nails. 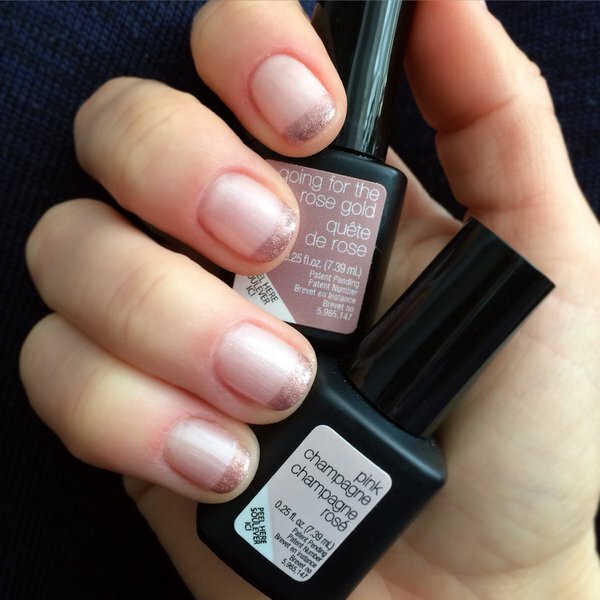 A simple French tip style design, using SensatioNail colours ‘Pink Champagne’ and ‘Going For The Rose Gold’. It’s as simple as anything. Buff, put on primer, apply base coat and cure for 30 seconds, apply two coats of colour and cure for 1 minute each, finish with the clear coat and cure again – job done. SensatioNail offers around 90 gel colours, ranging from elegant to vibrant, all reasonably priced at £12.50 (if you buy them from their website; £15 at Boots). The SensatioNail starter kit comes with a lamp, all essentials (primer, base/top coat, etc), and two gel colours (different colour options available), currently priced at £49.99. 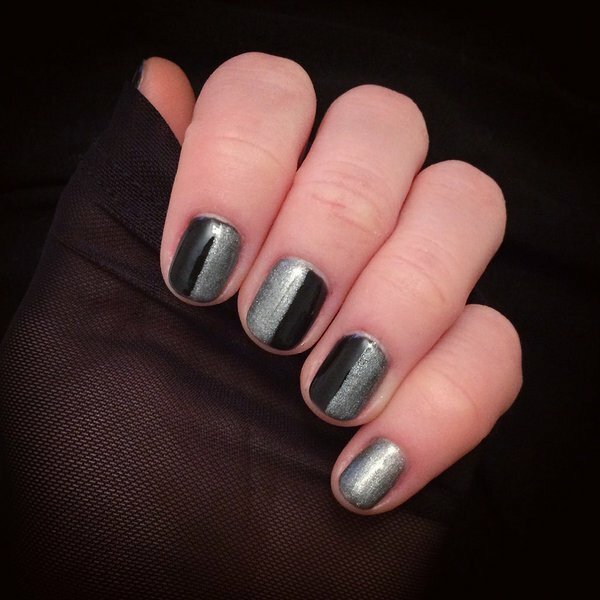 Within a few weeks of doing my own gel nails, I was so comfortable with the routine that I started experimenting with glitter coats, French tips, studs, stickers, layered colours – all the nail designs I never used to bother with because if you do them with normal polish they take hours to dry. Now I can do a bit of nail art with multiple layers and accessories and event the more complex, layered styles don’t take more than an hour. And, best of all, this gel polish just lasts and lasts, without chipping or peeling or losing its shine. I’ve read it depends on your nail type and some of my friends have reported their manis only last for about a week, but on my nails every colour I’ve tried so far has lasted a full two weeks. 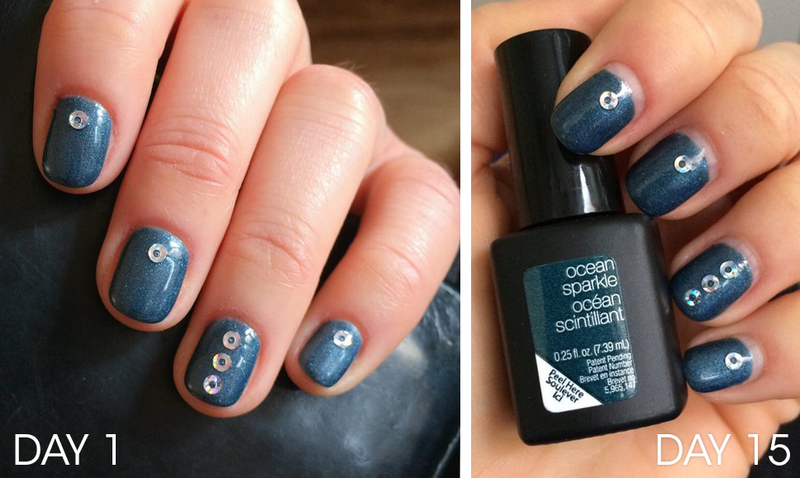 Here’s a comparison of SensatioNail colour ‘Ocean Sparkle’ with silver sequins on day 1 and day 15 – grown out of course, but otherwise still spotless after two weeks of wear. 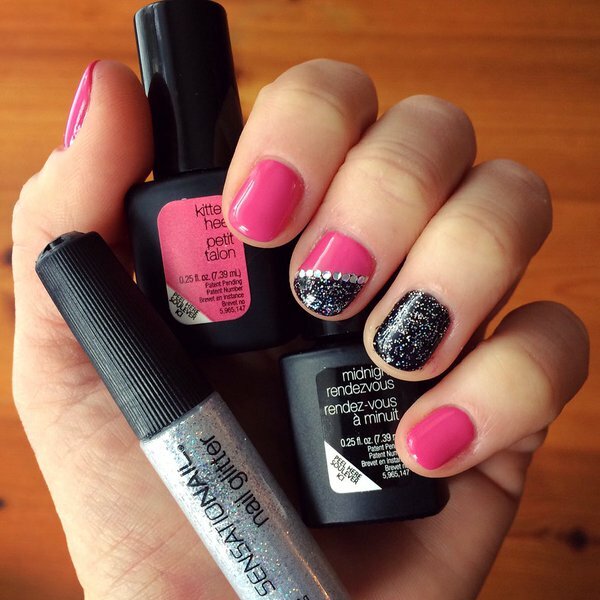 Simple two-tone design using SensatioNail colours ‘Midnight Rendezvous’ and ‘Disco Fever’. One of my favourite colour combos so far. SensatioNail colours ‘Pink Champagne’, ‘Mauve Maven’ and ‘Rose Gold Glitter’ layered with the help of striping tape. My favourite pink nail polish ever, SensatioNail ‘Kitten Heel’, layered here with ‘Midnight Rendezvous’, a sprinkling of silver glitter and a few sparkly nail gems. And there’s another neat trick you can do with this. 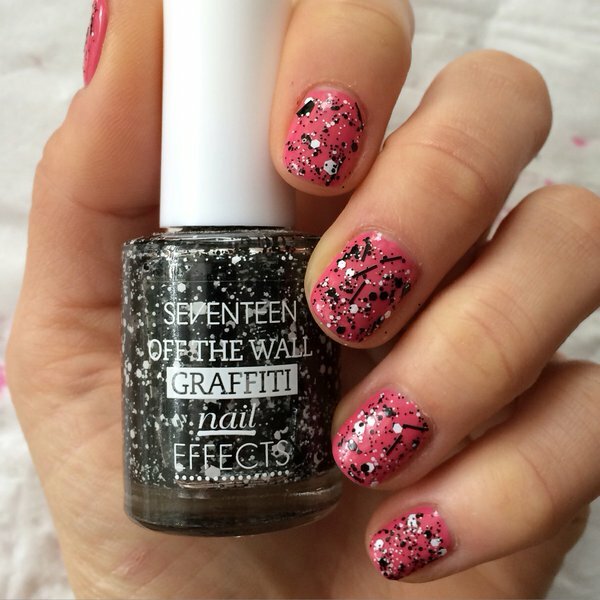 Here I’ve used SensatioNail colour ‘Kitten Heel’ with a layer of regular top coat with graffiti style particles. I finished the gel process as usual, top coat and everything, then applied a layer of the graffiti polish, let it dry and fixed it with another layer of gel top coat. It lasted for about a week before the graffiti coat started peeling off the gel mani underneath. 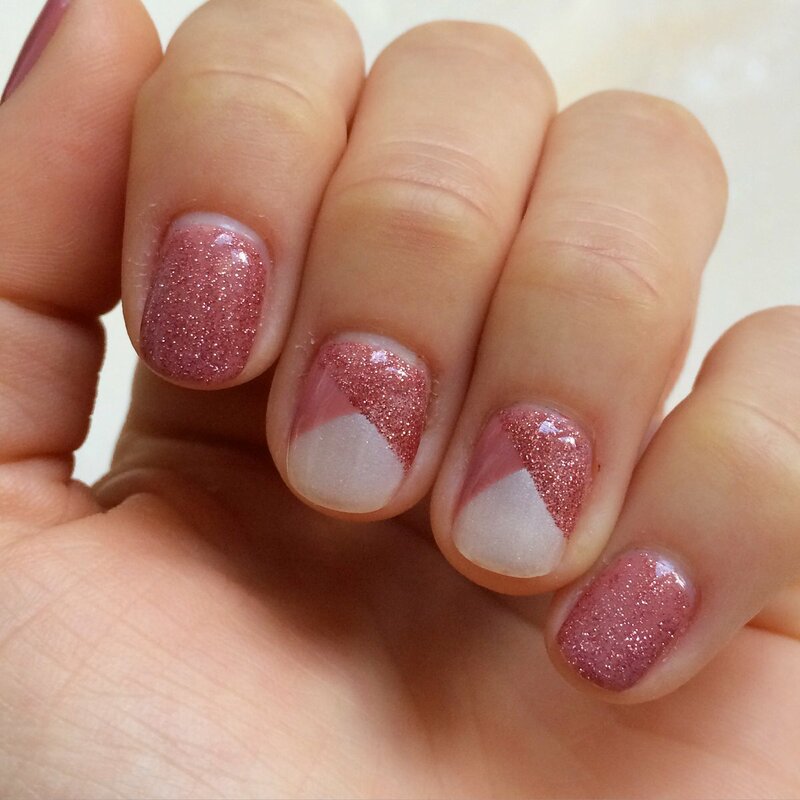 Great way to freshen up a gel mani for the second week. Now that I’ve had glamorous nails for half a year, I can honestly say the SensatioNail kit has been the best beauty product I’ve ever invested in. And this post isn’t in any way sponsored or paid, by the way – purely my own, honest opinion on a fabulous product. I don’t even write about beauty stuff on this blog, I had to shout about this one.